Texas Landscape Creations offers a wide variety of services for both commercial and residential landscaping and lawn maintenance customers in Georgetown. Call 512-992-9252 today to schedule your free estimate! Give your business the TLC it needs! From design and installation to continued maintenance, Texas Landscape Creations can create an area that both meets your businesses needs, while also providing an enjoyable environment for your employees and customers. TLC takes pride in bringing beauty to the Georgetown community! 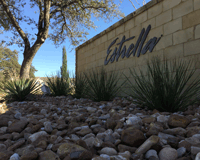 We are currently working with the Estrella Subdivision to ensure that their residents enjoy a well maintained, aesthetically pleasing environment year round. Our commercial maintenance plans include mowing, edging, weed eating, trimming plants, flower bed maintenance and mulching. TLC can also take that a step further and provide color changes or designs for future improvements to the site. 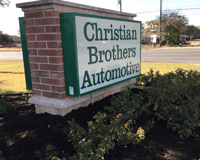 Georgetown’s Christian Brothers Automotive also trusts Texas Landscape Creations to provide a well manicured area for customers and employees to enjoy. TLC can also assist with landscaping design, new landscaping installation, and irrigation installation, modifications and repairs, as well as building retaining walls and using rock and pavers to create an area unique to your business and style. For more information on how Texas Landscape Creations can assist your business or HOA or to request a bid for a commercial project, submit our contact us form or call 512-992-9252. Whether you’re considering a complete overhaul or just a lawn maintenance plan or clean up, we’ll work with you to fulfill your vision while also keeping in mind your budget. TLC specializes in providing professional results customized to your needs. Submit our contact us form or call 512-992-9252 for your free landscaping, irrigation or lawn maintenance quote!